Winger Cristiano Ronaldo has signed a two-year contract extension with Manchester United. 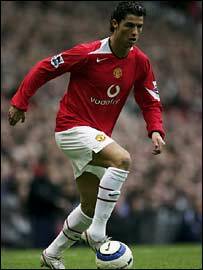 Real Madrid and Barcelona had both been reportedly interested in Ronaldo, 20, who signed for United for £12m in August 2003 from Sporting Lisbon. The new contract will keep him at Old Trafford until 2010. Ronaldo told the United website: "I am very happy and proud to finally put a deal on paper. It is important for the development of my career." Ronaldo played 40 times for United last season, scoring nine goals. Sir Alex Ferguson added: "It represents our faith in young players at the club and Ronaldo will develop into a fantastic player. "We have worked hard over the last six months on securing a contract, there were no problems but with his agent being in Portugal it was all to do with timings. "This is great news for the club and for the fans." Ronaldo has won 29 caps for Portugal, scoring 10 goals for his country.